“Hands,” “mouth,” “time,” “body.” “Fingers, skin, story, touch.” “Come close.” “Know me.” These words appear most frequently in Kelli Allen’s Imagine Not Drowning. They quickly assert the book’s concerns. See me watching you. Listen to me speak. Help me make this shared experience meaningful. And indeed, it is the touches we exchange – physical, intellectual, emotional – that again and again come under close scrutiny in these beautiful poems. On the day before we learn to distrust it, grief is welcome. song. There are four words for this: waiting, resistance, sigh, alchemy. to whatever you might sing next. near the temple which will be, of course, the center of it all? I can watch yours make sense of this story. In the end, the poet generously leaves us the opportunity to connect the dots, to decide for ourselves what this multifaceted message is about. We refuse to grow and then the encounter forces us to do so; we see and become affected, we hear and are rendered vulnerable. We want to be noticed. 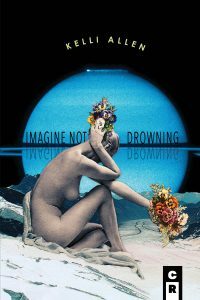 Imagine Not Drowning reclaims one’s existential role, one’s right to mean something, to make a difference. There are four words for this collection: insightful, inspired, electric, powerful. A. Molotkov was born in Russia and moved to the US in 1990, switching to writing in English in 1993. His poetry collection, The Catalog of Broken Things, is just out from Airlie Press. Published or accepted by Kenyon, Iowa, Cincinnati, Massachusetts, Atlanta, Tampa, Raleigh, New Orleans and Cider Press Reviews, Pif, Ruminate, 2 River and many more, Molotkov is winner of various fiction and poetry contests and a 2015 Oregon Literary Fellowship. He co-edits The Inflectionist Review. Learn more about him at amolotkov.com.